2. Bake at 350 degrees Fahrenheit (176 degrees Celsius) for 9 min. 1. Make icing – in stand mixer, mix together water meringue and tartar. Add sugar and mix until incorporated. Add corn syrup, glycerine, and emulsion and beat until stiff peaks form. 2. Mix colors – divide icing in to small bowls`. Add coloring to each bowl – ivory, gold, white and red. Using a small squirt bottle filled with warm water thin down the icing to the right consistency. 3. Ice cookies in sections, placing cookies in front of fan to set each section before icing the next section. Use airbrush for coloring and spray cookies with pearl sheen after they are complete. Mix cinnamon and sugar together and set to the side. Cream butter and sugar, add egg and vanilla. Mix flour, tartar, salt, and soda. Add dry to wet. Use small cookie scoop or tbsp. to scoop balls of dough and roll them in sugar cinnamon mixture. Bake 8-10 min at 350 degrees Fahrenheit (176 degrees Celsius). 1. On stove in medium pot melt butter, add maple syrup, powdered sugar and extract. Mix brown sugar and cinnamon and pecan flour on a plate. 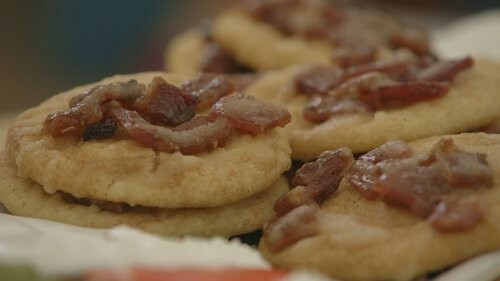 Dredge bacon in cinnamon sugar mixture and place in a half sheet pan lined with foil and with a cooling rack fitted inside. Spray cooling rack with non-stick spray (like PAM). Lay coated bacon on the rack and put in oven at 350 degrees Fahrenheit (176 degrees Celsius) for 25 min or until crispy. To assemble cookie put cookie on a drying rack, maple glaze in a tipless bag. Chop bacon. 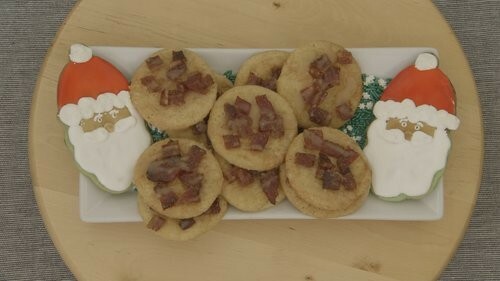 Drizzle maple glaze over cookie and lay bacon on top of glaze to resemble French toast casserole and bacon.